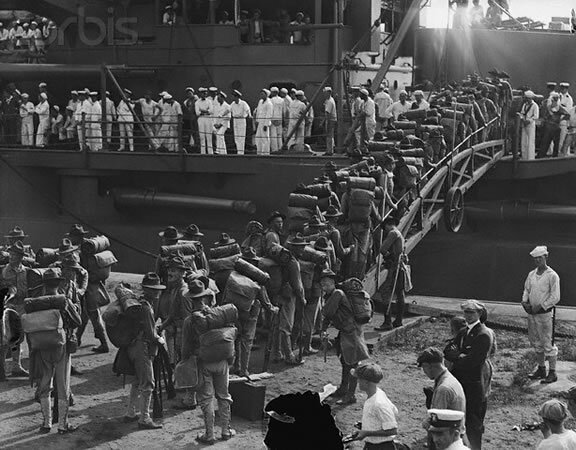 US Marines boarding the U.S.C Connecticut july 1915 to Haiti. In the beginning, following the assassination of Jean Vilbrun Guillaume Sam, a Pro-U.S Haitian President, the U.S President Woodrow Wilson sent a first team of U.S Marines into Haiti on July 28, 1915. They were sent to restore order and maintain political and economic stability in the country. However, in the wake of the First World War, the President Wilson at the same time also wanted to establish U.S dominance in the region by keeping the German settlers away from Haiti. Because, the peasant guerrillas (cocos) from the northern Haiti were heavily burdened with German loans and they wanted the Germans to invade and restore order in the country. Thus the 19- year U.S. occupation in Haiti began with the landing of 3,000 Marines at Port-au-Prince under the leadership of Admiral William B. Caperton and that continued until 1935. However, prior to that in December 1914, in the fear of foreign intervention, Wilson administration sent U.S. Marines to Haiti who removed $500,000 from the Haitian National Bank for safe keeping in New York.